Advanced Fantasy Baseball: Time to Dump Manny Parra? In my primary NL-only league with Manny Parra I am in second place, two points out of first place. In a 16 team mixed league, I'm in fourth place with Manny Parra, second place without him. In the mixed league I have no choice but to hang on to him until he is either disabled or killed by some aggravated fantasy owner. (Jon is in no way endorsing such a move, regardless of his rising level of frustration -- legal department) But in the NL-only league I was holding him because I had hopes that he might turn it around. My hopes are fading fast. A lot of my faith in Manny Parra developing into a frontline starter was based on his strong finish in 2008. Combined with his great scouting reports and glowing resume I figured I couldn't go wrong. 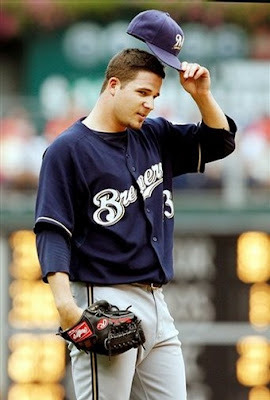 However, since joining the major league team, Parra has seen his control degrade from good to horrid. He is still good at inducing groundballs but the homeruns still kill him. You can make the case that his luck is just awful based on three years of FIPs significantly lower than his Earned Run Averages. He has also had an elevated BABIP in the majors, he has never had one below .332 in the majors. But how much is enough? How long should you...how long CAN you wait before you have to dump a player like this for the sake of your season? We've just passed the one third marker of the season and for me that is when worrying about slow starts and poor performances is kicked up a notch. This is when I'm doing everything I can to get value for the David Ortiz on my rosters (not that I actually rostered Ortiz, large, older players coming off of sub par seasons are not usually high on my draft list). I plan to do one round about the members of my NL-only to see if I can dump Parra on them. If not I'll FAAB the best arm on the free-agent list. I still believe in Parra's future, but I'd rather win than wait for it to happen.